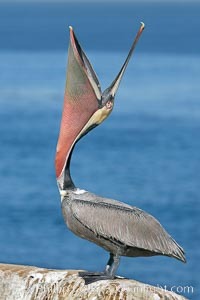 During winter months California brown pelicans (Pelecanus occidentalis californicus) adopt striking plumage. The gular pouch (throat) of adults transitions from olive green to bright red. Breeding adults are characterized primarily by a dark brown hindneck, and may also show a yellow patch at the base of the foreneck. Nonbreeding adults retain the white hindneck but, since they also may display a red gular pouch, they are sometimes mistaken for breeders. Head coloration in adults can be white, yellow or a mix of the two, and becomes speckled during molt or chick-feeding.